As an annual tradition, RJE celebrated Santa and the Holiday season with the families of our employees. On Saturday, December 10th Santa Claus made a special visit to the RJE furniture showroom with his side kick Dante the elf. The children were filled with joy and the adults were too as they stuffed themselves with donuts and coffee! Each child was called by name to sit on Santa’s lap and receive a special gift. The day couldn’t have been more special. We look forward to next year’s visit from Santa! The fun for the Holidays did not end there for RJE. 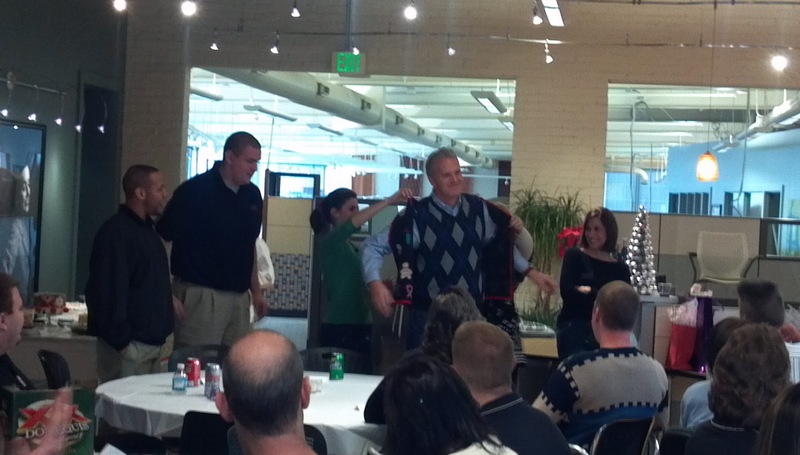 As a company, we celebrated our Holiday luncheon on December 23rd with fun, food, and games! 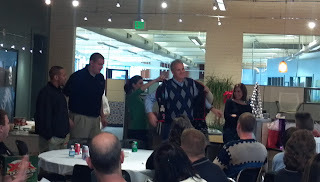 The party could not begin until Denny Sponsel, a.k.a The Big Kahuna, was adorned with the special Christmas vest. 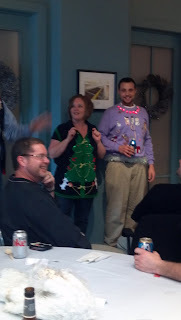 The RJE family decided that we needed to have a special ugly Christmas sweater contest ourselves. Doug Warrix from our service and operations team really out did himself this year. From the lights around his collar to the candy canes draping from his waist, no one could deny that Doug had the ugliest sweater of all! As a tradition for 6th year, we held our dessert contest to see you could not only sell or install furniture, but who could make the most decadent treat! The Harrison College Chef’s Academy was gracious enough to serve as our judge. This year’s winner was Matt Callahan served up a red velvet peppermint delight! Winning this contest made Matt’s Holiday complete. The luncheon could not come to an end without the RJE family presenting Denny with a special gift to show our love and appreciation. What a wonderful time of the year! As 2011 ended and 2012 is well on its way, the RJE team looks back on a wonderful year and cannot wait to make your spaces all you ever dreamed of!